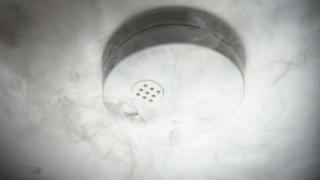 British Standards-approved smoke alarms have "wildly varying" response times, according to a new study by Which?. An investigation by the consumer group found some alarms could take twice as long to sound as others, with one brand failing to go off at all - despite having BSI Kitemark certification. Which? said the delays could lead to "unthinkable consequences". BSI - formerly known as the British Standards Institution - said its tests ensured "adequate warning" was given. Which? carried out four controlled tests with different burning materials - smouldering wood, solvent, plastic and cotton - on 15 different smoke detectors. The Devolo Home Control Smoke Detector - one of the most expensive products on the list - did not sound in two of the tests. The company said the detector had passed test procedures in two German laboratories, but safety was its "number one priority", and it would be "extensively investigating" the results. In the smouldering wood test, two approved examples of the First alert SA300Q and the EI Electronics Ei3500S took more than nine minutes to sound, whilst the Nest Protect Smoke and Carbon Monoxide Alarm was more than four minutes faster. Which? said the varying speed at which the alarms sounded was the same across all tests - although each product did meet the BS EN 14604 standard response time to receive their Kitemarks. Alex Neill, Which? managing director of home products and services, called for standards tests to be changed. "People will be surprised to see such a big variation in response times from alarms that are currently classed as being safe and which pass the standard," he said. "We want to see stricter testing criteria because every minute counts in a fire." BSI said the tests carried out to achieve the standard were "not designed to ensure all detectors respond similarly". A spokesman added: "The test fires set out in the standard are designed to ensure that whichever technology is used, or the type of fire encountered, the smoke alarm provides adequate warning in the event of a real fire. "Smoke alarms are allowed to respond earlier than the limits and often do." The findings from the investigation have been passed onto Trading Standards. Are you happy with your smoke alarm? Or have you had problems with one? You can share your experience by emailing haveyoursay@bbc.co.uk.